Once I picked up this , I got hooked! Her dialogue is flawless. She creates a "voice" for the dog that is uniquely his and she captures the different personalities that move around him. She keeps the emotional suspense up throughout the book: we have romantic liaisons and we can't help wondering what will happen to those we meet. It's a feel-good story, no doubt about it.
. It moved me to tears in some places and laughter in others. If you love dogs youll love this book. It is refreshing to read the English language as it is meant to be, without any profanity. Codyman deals with real life issues of true importance in such a subtle gentle way. Issues of kindness, friendship, loyalty, generosity and spirit. I was left not with a sense of preaching or concrete ,right or wrong answers, but rather a sense of responsibility to my fellow man. Long after I read I found myself wondering how I line up in my treatment and judgment of those around me. One more thing, after reading the The Codyman you become very careful of what you say around your dog. Linda Stubbs I Am The Codyman is a engaging and entertaining novel about a dog with an unusual talent. Living at a hotel as a bequeathal from his late "mother," Cody has his own suite; each night a hotel guest is allowed to enter and confess their hearts and troubles to the understanding and sympathetic canine. Highly recommended and rewarding reading, I Am The Codyman is a story of helping people find happiness and the insight that comes from trust. What a delightful read. A lighthearted, poignant, and often funny that will appeal to readers of all ages. A memorable and original story. It showed how much people can benefit from a little help in the right direction, whether it comes from people or from dogs. We need more than food, water, and shelter in our lives. We also need companionship, love, and imagination, as this story so lovingly tells us. in finishing a real good read. The codyman was one of these. most of us slide through life championing our own causes. that snap to Codys dialogue. I look forward to the nextpublication from Linda, but must insist she buy the kleenex tissue for the wimps in the crowd. This is a fun read! It made me laugh out loud, it made me cry. The dog never does anything that any ordinary dog wouldn't do, yet the author takes us right into the mind of the dog and gives us a viewpoint that most people don't think of. That's what makes it so funny - yet so real! I actually look at my dog differently now! It is written in short sections which makes it easy to pick up for short periods of time. Of course, I didn't always want to put it down after a short period of time! I read it quickly because it was so enjoyable. Linda Stubbs captures the personality of a West Highland white terrier without sounding silly or trite. The short chapters make for great bedtime reading, even by or to children. And Cody's encounters lend themselves nicely to family discussions about friendship, trust, and caring for the less fortunate. Cody's tale is imaginative, engaging, and lively -- fun reading for book and dog lovers of all ages. The first-person narration of I Am the Codyman from the dog's point of view gives this novel its unique charm. Linda Stubbs captures the energy and intelligence of a West Highland white terrier without sounding silly or trite. I Am the Codyman is a great book to read as a family, with short chapters perfect for bedtime reading. And Cody's encounters lend themselves nicely to discussions about friendship, trust, and caring for the less fortunate. 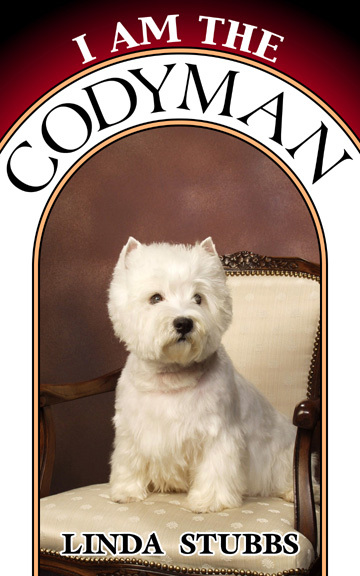 Cody's tale is imaginative, engaging, and lively -- just like a Westie! -- and fun reading for book and dog lovers of all ages.